This article is about the stage. For other uses, see Paper Mario (disambiguation). Paper Mario in its Hither Thither Hill form. Paper Mario (ペーパーマリオ, Paper Mario) is a stage in Super Smash Bros. for Nintendo 3DS and Super Smash Bros. Ultimate. 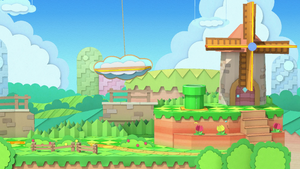 The stage is based on several areas from the Paper Mario series, and its layout shifts between three versions in a pop-up book style. Mario, Luigi and Wii Fit Trainer fighting on the Hither Thither Hill section of the stage in SSB4. The starting variation is based on Hither Thither Hill from Paper Mario: Sticker Star. It features a windmill that will spin under a heavy player's weight and a pipe that pushes into the air anyone that stands on it. Near the end of this variation a fan appears in the background and generates a strong wind which blows away several stage elements and pushes fighters to the right of the stage. When the stage transitions from this form, the cloud going up will KO anyone on it. The S.S. Flavion version, with a giant Blooper, in Ultimate. The second variation is based on the S.S. Flavion, a ship from Paper Mario: The Thousand-Year Door. The ship may be accompanied by a giant Blooper, a recurring boss in the series: it does not directly interact with the stage, but it does form waves in the water that can carry players. Another possible occurrence is the appearance of the Whale from the original Paper Mario, which raises the ship with water spouting from his blowhole. This stops the ship's rocking and carries it closer to the upper blast line. The Bowser's Sky Castle variation, with Bowser's head spinning, in SSB4. The last variation is Bowser's Sky Castle from Paper Mario: Sticker Star, which features a large bust of Bowser's head plus two floating platforms that move up and down on either side. The head's eyes will occasionally glow to denote what it does next: Red means it will start spinning, making it hard to stand on, and white precedes the head's jaw clamping shut, which deals moderate damage and knockback to anyone inside it. The edges on Bowser's head cannot be grabbed, potentially causing KOs when it spins. After a while, the scene switches back to Hither Thither Hill and the cycle repeats. In Super Smash Bros. for Nintendo 3DS, the Ω form takes place on a completely flat version of the Hither Thither Hill part of the stage that extends below the blast line. In Super Smash Bros. Ultimate, the Ω form and Battlefield form are set on a slightly redesigned version of SSB4's Ω form; however, the main platform no longer extends below the blast line and is resized and reshaped to match Battlefield. The windmill is also absent in the background. The three soft platforms of the Battlefield form are yellow platforms that are unique to this form. Hither Thither Hill as it appears in Paper Mario: Sticker Star. Hither Thither Hill comes from Paper Mario: Sticker Star. In that game, Mario had to use the Fan sticker to access the windmill since the pedals were blocking its entrance. When he used the sticker, a cutscene played where several nearby obstacles were blown away. When used in battle, the Fan sticker would blow all enemies around. The S.S. Flavion as it appears in Paper Mario: The Thousand-Year Door. 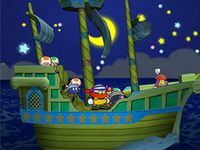 The S.S. Flavion appeared in Paper Mario: The Thousand-Year Door, where it was the ship of Flavio. During Chapter 5, Mario and his party had to use it to sail to Keelhaul Key. After several days of sailing, they were ambushed by several Embers. The ship wrecked on Keelhaul Key, and its scraps were used to set up camp on the island. Large Bloopers are recurring bosses in the Paper Mario series, most notably in the first three. The specific Blooper bears a strong resemblance to the one fought in The Thousand-Year Door. The Whale from Paper Mario, who was used to take Mario to Lavalava Island, makes an appearance, using his water spout to lift the S.S. Flavion a notable distance above the water. The background is the same one from Riverside Station in Chapter 6. Bowser's Sky Castle comes from Paper Mario: Sticker Star. Here, Mario and Kersti face off against Bowser in the final fight for the last Royal Sticker. The Hither Thither Hill section in Super Smash Bros. for Nintendo 3DS. The S.S. Flavion section in Super Smash Bros. for Nintendo 3DS. The Hither Thither Hill section in Ultimate. The S.S. Flavion section in Ultimate. Incineroar, three Pikachu, and two Pichu on the stage. Paper Mario and Pac-Maze are the only non-DLC stages in Super Smash Bros. for 3DS from universes with a playable character to not appear in All-Star Mode. In Super Smash Bros. Ultimate, Paper Mario is not used for any character's Classic Mode route in any form. Interestingly, in the Ω form of the stage, it appears there is a small gap underneath the stage where a fighter could go, but in fact the stage's collision box goes all the way to the blast line. This is most noticeable when using a wall-cling capable character, as it can appear they are clinging to air. This page was last edited on April 17, 2019, at 02:19.